Locally Sourced is a showcase from British Council and Scottish Documentary Institute’s ‘Stories of Cities’ series, created as a travelling workshop to get local filmmakers to celebrate where they live. The workshops relay creative documentary skills to up-and-coming filmmakers in developing and emerging countries, equipping them with the creative tools to explore new identities, and empowering them to take control of their own national image. These intensive seven-day film-led workshops raise the ambition, knowledge and skills of local documentary filmmakers with the bonus of creating beautiful short films for an international market. 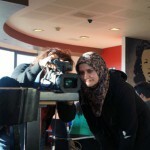 The collaboration with British Council Film and their regional offices enabled the programme to access places such as Libya at critical moments in their history. The films presented here will show that the ‘quiet’ stories behind the headlines have the power to move us in equal measure. This screening will be followed by a Q&A with Will Massa (British Council), Anis Barghouti (Palestinian Young Filmmakers Association) and Noémie Mendelle (Scottish Documentary Institute). For further information on tickets and booking follow this link to the Watershed.